Bewaye coffee originates from the Amaro District in the celebrated southern territory of Ethiopia. The Koore people make up 97% of the inhabitants of Amaro. They are a distinct ethnic culture that is known for their traditional irrigation systems and terraced agriculture. Coffee grows side by side with enset, teff, wheat and grain. Enset is the main staple food for the region. Over sixteen hundred small growers in Amaro bring their harvested coffee to be processed at the Bewaye wet mill where it is pulped and fermented for approximately 36 hours, weather depending. 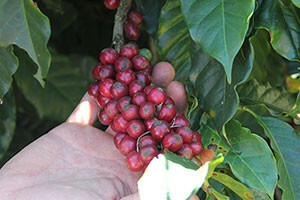 The wet coffee is then dried on raised beds from 10 days to 2 weeks. Small growers farm an average area of 0.5 hectares at an elevation of between 1900 and 2300 meters above sea level.